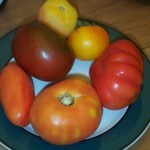 Tomatoes are ripening in our gardens and I’m always interested in a new way to use them. An old friend from where I used to live shared this recipe with me, and it’s mmm, especially when the tomatoes and basil are picked fresh from the garden, or bought fresh-picked at a local farmers market. Her recipe uses chicken stock, but a veggie broth could be used for a vegetarian version. My friend Kevynne in Portland sent me this recipe, which I have adapted for my own ingredients (homemade chicken stock, etc.). Kev recommends that if tomatoes are not at their peak of sweetness add ½ tsp sugar to the soup. 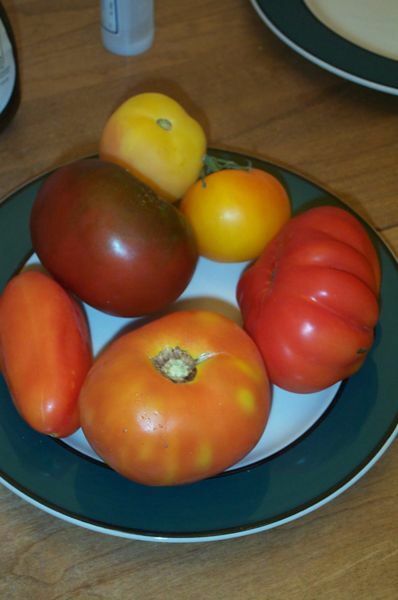 Alternately, use good quality canned tomatoes, such as Muir Glen organic brand. She doesn’t indicate how many this recipe serves, but my guess is that it makes at least 6 cups soup, so probably serves 4 – 6. Heat olive oil in pot over medium high heat; saute onions, stirring occasionally, until softened. Add tied basil, tomatoes, stock, salt and pepper to the onions. Bring to a boil over high heat; reduce to medium low and simmer uncovered, until reduced by one-quarter, about 20 minutes. Let cool. Remove basil. Puree soup in batches in blender until very smooth, at least 3 minutes. Strain soup into cleaned pot and bring to a simmer over medium heat. Remove from heat, stir in cream and balsamic vinegar. Adjust seasoning as needed. Just before serving, cut basil leaves into strips and garnish each bowl. This entry was posted in Dairy, Fat or oil, Herbs and tagged balsamic vinegar, basil, bone stock, cream, onion, tomato, vegetable broth. Bookmark the permalink.